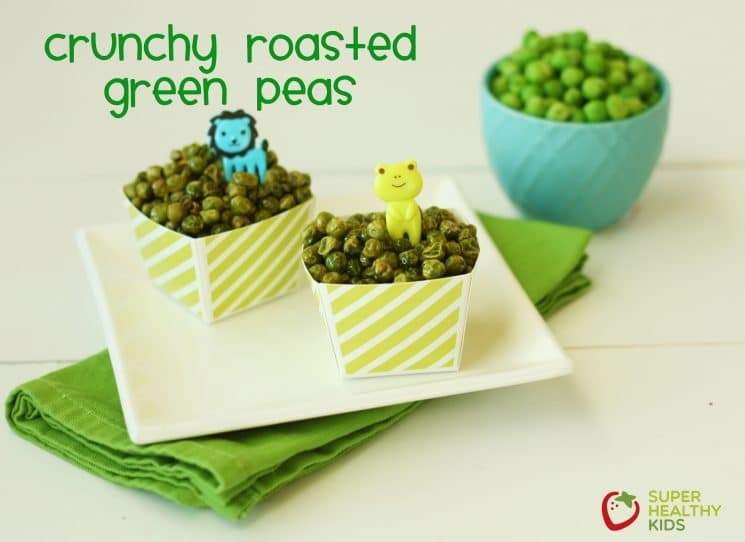 Green peas are a veggie that my kids absolutely love. I don’t serve them all the time because we believe in variation and balance and I want them to try new things. 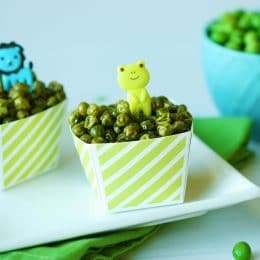 This version of roasted green peas makes them crunchy and the sweetness of the pea comes out even more. 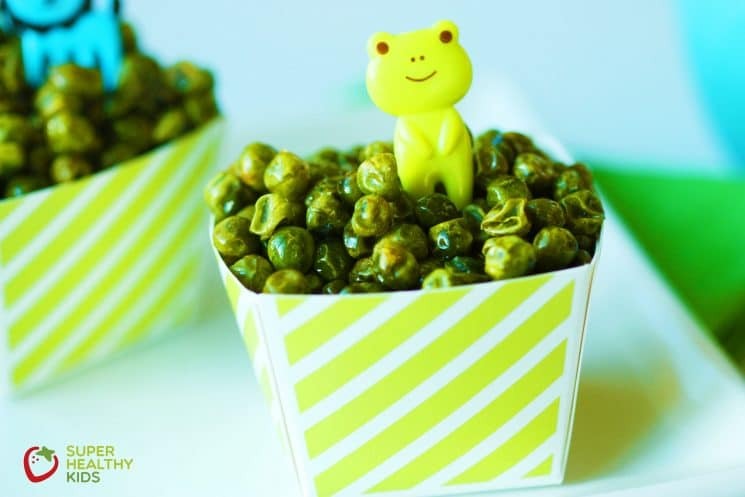 This Crunchy Roasted Green Peas Recipe is the perfect snack for at home or on the go! Preheat your oven to 375 degrees F. You can use frozen or fresh peas for this recipe. If you are using frozen, let them thaw and then blot them with a paper towel to get as much moisture off them as possible. If you are using fresh, you will want to quickly blanch for 1-2 minutes and then dry them with a paper towel. Next, place in a bowl and combine oil and garlic salt. Coat evenly by stirring well. Spread them on a baking sheet lined with either parchment paper, a Silpat or tin foil. Make sure they are in an even flat layer. Bake in the oven for 30 minutes, then shake and kind of stir them around to make sure they are cooking evenly. You can try them at this point to see if they are crunchy enough for you. If they need more time return to the oven for increments of 15 minutes until they are nice and crunchy. Once they are cool, you can store in an airtight container and take with you on the go! The peas shrink to about half their size and so I have to make a HUGE batch if we want any leftover. These are a great snack to make in the morning and then take with you for an afternoon at the park, or in the car when you are dropping kids here and there! 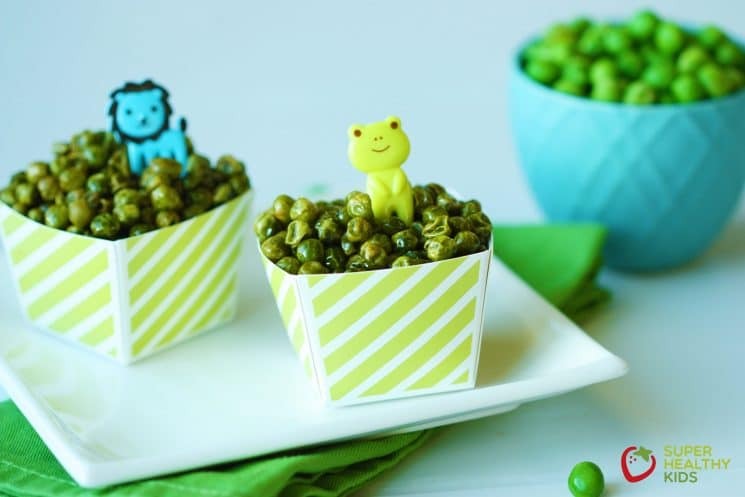 We hope your kids enjoy these crunchy peas as much as we do! Allow the peas to thaw, then blot them with a paper towel to get as much moisture off them as possible. Place them in a bowl and add oil and garlic salt. Stir to coat evenly. Spread them on a baking sheet lined with parchment paper or aluminum foil. Bake in the oven for 30 minutes, then shake and stir them around to make sure they are cooking evenly. You can try them at this point to see if they are crunchy enough for you. If they need more time return to the oven for increments of 15 minutes until they are nice and crunchy. If you can make vegetables into a kids favorite snack, count me in. I never would have thought to make crunchy peas. If I’m making a big batch, what’s the best way to store leftovers? These look great! Thanks for sharing! Well – I stored mine in the fridge, but it made them a lot less crunchy. If you stored them in an airtight container on the shelf I’m sure they would be great! These look so easy and fun to make! My two year old can definitely help 🙂 Are these very crunchy and do they burn quickly/easily? Yes – they are definitely crunchy! The key is to start with peas that don’t have a lot of moisture. I feel like fresh turn out a little better than frozen, but frozen will still turn out great if you thaw them and pat off the water thoroughly. I haven’t had a problem with them burning, but I would definitely watch them towards the end. I did shake them a couple times during cooking to get them to cook evenly. Just finished making these, they are delicious! Did not wait for my frozen peas to defrost. Just blotted them after a few minutes while I prepared the sauce, and they seemed to be equally crunchy. My 2 year told really enjoyed them. Thank you for this wonderful alternative for peas! Going to try this tomorrow with Garlic Powder rather than Garlic Salt to reduce the sodium. Thanks! My fussy 5 year old ate it and said it was nice but it doesn’t look appealing so the rest didn’t want to try. I quite liked it. Burned or chewy. I am going to keep trying. I love the store bought ones and really wanted to love these. My child is diabetic so I used garlic powder instead of garlic salt and we all loved them. Thank you.